This five reel, three-row slot is by Pragmatic Play, and belongs to the ‘Old West’ theme of online slots, taking its inspiration from the world of country and cowboys. The slot has twenty-five fixed paylines, RTP of 96.53%, and ‘Free Spins’ and ‘Money Collect’ features to keep players entertained. We’re very happy to offer it to our players here at Amigo Slots, where we also offer hundreds more great slots such as Starburst, Chilli Heat, Rainbow Riches and Fluffy Favourites. This slot was the first release of 2019 for Pragmatic Play, and serves as a sequel-of-sorts to 2018's highly popular and award-winning Wolf Gold. That smash hit slot had an ‘animals and nature' theme and an Old West setting. Mustang Gold also takes its inspiration from a similar theme but has a particular focus on cowboys and their steeds. Find your best Stetson, saddle up and get spinning! At face value, this is quite a simple slot. There’s nothing over-the-top about the bold and friendly graphics (although they're well drawn), the layout is familiar, and the number of paylines is fairly standard for a slot game. It is, however, linked to a progressive jackpot. Depending on how your game is going and how lucky you are, that progressive jackpot can yield prizes as small as the £125 mini jackpot or as large as the £2,500 grand jackpot on any spin. It adds an extra dimension to the base game and gives players something else to aim for. All of the fun to be had in Mustang Gold happens on a wooden and rustic frame, with a plain blue background and few distractions away from the reels. The soundtrack will get your toe tapping though; with plenty of horse whinnying and distant whistles, if you closed your eyes, you might imagine that you were watching an old Clint Eastwood Western instead of playing a slot. In the spirit of keeping things simple and easy to follow, the traditional playing card symbols appear on the reels as those with the lowest worth. They're represented by J, Q, K, and A. Above them is a cowboy, a cowgirl, a black horse, and a white horse. We're not clear on which horse belongs to which rider, so you'll have to fill in the blank there yourself! The slot's logo serves as the wild. It's restricted to appearances only on the second, third, fourth and fifth reels. When it does turn up, it will replace all of the slot's standard symbols to create new winning combinations. We emphasize the ‘standard' part because there are additional symbols to be taken into account, too. First up is the campfire symbol, which is a scatter. It appears only on reels two to four and serves a purpose in the slot’s bonus features, which we’re about to discuss. The other two symbols work in tandem; a set of horseshoes which will have differing cash values printed onto them, and a sheriff's badge which reads ‘collect.' These factor into the game's bonus features too, and so this is now the right time to tell you all about them! 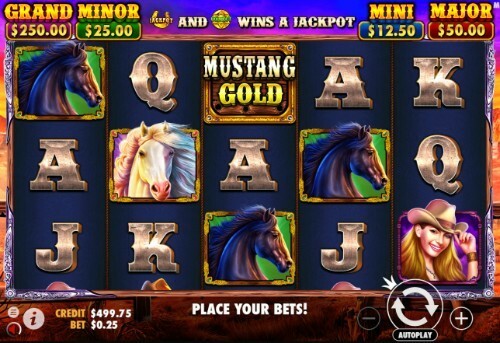 Aside from the progressive jackpot, Mustang Gold comes with two bonus features, both of which can make your time playing it a much more profitable one. Free Spins is the first bonus on offer. You trigger this feature by landing three campfire scatters on any one spin, which is enough to get you eight spins at zero cost. Finding three more scatters during your free spins re-triggers the round and gives you a fresh set of eight spins. There are no multipliers applied to wins during free spins, but there are more of the horseshoes and sheriff's badges added to the reels. This is good news because they play into the Money Collect bonus! The Money Collect bonus helps Mustang Gold to feel unique and defines it as being materially different from its predecessor Wolf Gold. You're more likely to trigger a money collect payout when the free spins round is in operation because there are more of the necessary symbols on the reels, but it can happen in open play, too. Horseshoes can appear only on the first four reels. They'll show a cash value, but that cash value will only be paid out if you also land a ‘collect' badge symbol, which can only appear on the fifth reel. If the ‘collect' badge turns up, the combined cash value of any horseshoes in sight is yours. If of those horseshoes has the word ‘jackpot' written on it, you'll enter the Progressive Jackpot feature, in which you select horseshoes from a grid to find a matching pair. The matching pair you uncover will determine which of the jackpots is paid out to you. The combination of the ‘standard’ feature with the progressive jackpot is quite a unique idea, and adds an extra layer to Mustang Gold which you wouldn’t necessarily believe was there at first glance. It’s a simple looking slot which is easy to play, but it’s packing quite a punch in the bonus department. If you've played a Pragmatic Play slot before playing Mustang Gold, you'll realize you're playing a different slot by the same developer immediately. They have a very distinctive graphical style which runs like a thread through all of their slots. The studio opened in Malta in 2007 and has been taking the online slot world by storm ever since. We've already mentioned that the highly-acclaimed Wolf Gold was their work, for which they won a couple of ‘Slot Game of the Year' awards in 2018. They're also responsible for the vastly popular Great Rhino slot, as well as the mining-themed Gold Rush. Although they do experiment with other themes, they seem to treat the Old West and this period of history with a particular level of respect and focus, having returned to it multiple times. To date, Pragmatic Play has released more than one hundred online slots, with more coming out every month.